People might have noticed in the string of international friendlies that the Philippines played this September that goalkeeper Neil Etheridge increasingly had little to do over the course of each match. Against Singapore, there were two or three routine saves; but none of the Spiderman heroics that we all saw in, say, the second leg of the World Cup qualifier against Kuwait at the Rizal Memorial. While the Philippines lost in Vientiane to Laos, even then Etheridge’s involvement in open play was incidental. The two goals that he had to fish from out of the net, as everyone who saw the match knows, were from two penalties in a poorly officiated match. The second was certifiably not even a penalty. Going further back to the 2-all draw against Indonesia in Manila – when Etheridge came in cold in the second half and conceded two goals – goalkeeping intervention had started to become less of a pressing concern for the Philippines than it was not too long ago. In fact, Roland Müller had next to nothing to do in the first half. While Etheridge going to another club and getting regular first-team football may mean he becomes unavailable for many regional tournaments, the implications for the national team in terms of its long term ambition – i.e. the World Cup – are obvious. Of the recent Asean tour, the Singapore friendly in particular showed what a near full-strength Philippine team can do when fit, disciplined, patient and playing not only compact in midfield but even tighter at the back. Singapore passed and passed; but whatever light of day they were allowed to see was no more than fleeting and required no more than routine blocks or catches from Etheridge. While Singapore rightfully claimed that they were missing several key internationals, the Philippines, too, were missing the Guirado brothers, Dennis Cagara, Manny Ott and also Müller. That is a reasonable amount of ordnance missing from the armoury. The more that the Philippine team performs at the same level, the more it builds its international reputation. If sustained, this eventually adds up to the same psychological advantage that the country’s regional rivals enjoyed over us for decades. The signs are there that we are already being accorded the sort of respect that was not usually reserved for us in the past. Of course, the Laos result – even if FIFA subsequently discounted it from its books – burst the bubble of invincibility even before it could be fully established. 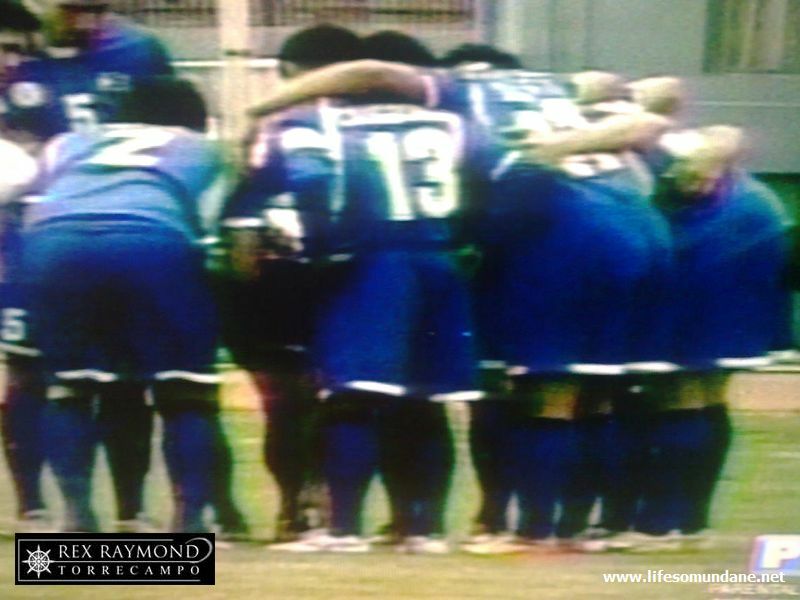 That said, Laos was something of a bogey team; and the Philippines were missing three game-changing players in Jerry Lucena and the Younghusband brothers from the Singapore match. In other words, the Laos game apart, for the Philippines goalkeeping will continue to become less of an issue the better the team becomes. It is getting better, the Vientiane result notwithstanding. When playing expansively against lesser teams, opponents will not be so confident on the ball; and this will make it easier for the Philippines to win it back and hold onto it. When playing against teams that are better at holding onto possession, the strength in midfield will mean that the opponents’ possession statistics are won in non-dangerous areas and they are forced to take relatively harmless shots from deep in midfield. The goalkeeper’s contribution is then restricted to kicking out back passes, picking up the ball from behind the goal or making routine catches every now and again. For the goalkeeper, then – whether it is Etheridge or Müller – the game becomes more of a challenge psychologically rather than physically. To illustrate, the goalkeeper of, say, QPR as a matter of club stature – and this is not meant to be disrespectful – is more involved in each game than that of, say, Manchester United. Thus, the QPR goalkeeper is forced by circumstance to stay mentally alert throughout each game because the ball in most fixtures either stays in his team’s half of the pitch or the opponents create the more dangerous chances. It is said that the true mark of a great goalkeeper is if he can make lightning quick saves and make the right decisions on the rare occasions that he is actually called upon to intervene in each match. Staying alert for all ninety minutes of each match, therefore, becomes a discipline required of goalkeepers playing for the top teams whose outfield strength means goalkeepers are left uninvolved for long stretches in each game. Suffice it to say that keeping goal for QPR is not the same as doing so for not only United but also the likes of Barcelona, Arsenal, Real Madrid and the other top teams. While the Philippines is not at all among the world’s fancied teams – and, indeed, a FIFA ranking of 150 is nothing if not modest – it is starting to win respectability in its own corner of the globe. This means that, at least playing within our neighbourhood, we will have more and more matches when Etheridge – or Müller – becomes significantly less involved than before. That is why, personally, I would like nothing more than for Etheridge to go out on loan, preferably to a top team either in the English Championship or even lower. This way, he gets to experience the same conditions that he can expect to play in the better the Philippine national team becomes. When playing in the club’s own division, he can be called upon to intervene once in a while. Playing against higher division teams in the cup competitions, on the other hand, he can gain all the match involvement and experience that he needs to keep his skills sharp. While I personally believe that Etheridge has what it takes to become a top-class goaltender, it helps neither Fulham nor the Philippines that he only plays the occasional reserve league match for his club. If it cannot be a top lower division club, then any club will do as long as he gets to play regularly. Would he have held onto the ball that Jason Sabio almost headed for an own goal in Singapore if he had been getting more matches at club level? Would he not have mis-kicked that innocuous back pass in Phnom Penh, the bumpy pitch notwithstanding? The questions are hypothetical; but they cannot be asked if he is playing regular first team football. In a way, Etheridge is in something of a crossroads. For another club to come in even for a loan deal, he has to be seen; and he cannot be seen if he is kept wrapped in paper. It has been said that the staff at Fulham has high regard for him as well. On the other hand, there is only limited joy to be had from continuous training and just a handful of reserve matches. While Etheridge is still young at 22, it must also be said that Iker Casillas won a Champions League medal for Madrid aged just 18. 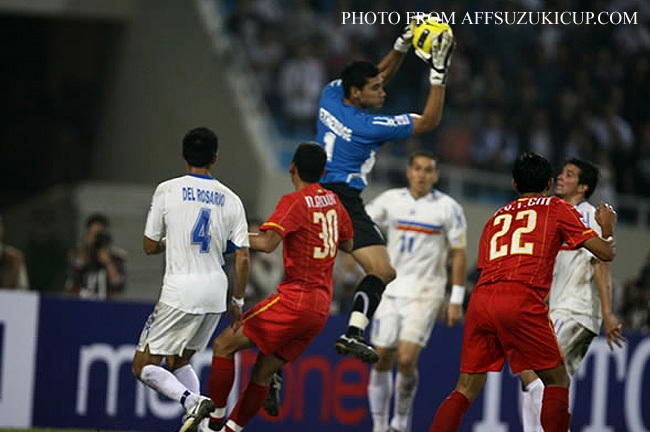 Etheridge is still also occasionally prone to indulge in fits of petulance, such as when he swung at a Turkmenistan player in the Challenge Cup to earn himself a red card and a ban; or when he came rushing from his goal to join the fracas in Laos in that tempestuous second half. While his coaches at Fulham were doubtless not amused by either incident, it does take actual match experience for players to realise that it is, indeed, always better just to get on with it. Remember a certain David Beckham, who while not a goalkeeper became England’s public enemy number one after getting himself sent off in a 1998 World Cup quarterfinal against Argentina? He finally attained superstardom and captained England after he learned to simply pick himself up and get on with it. 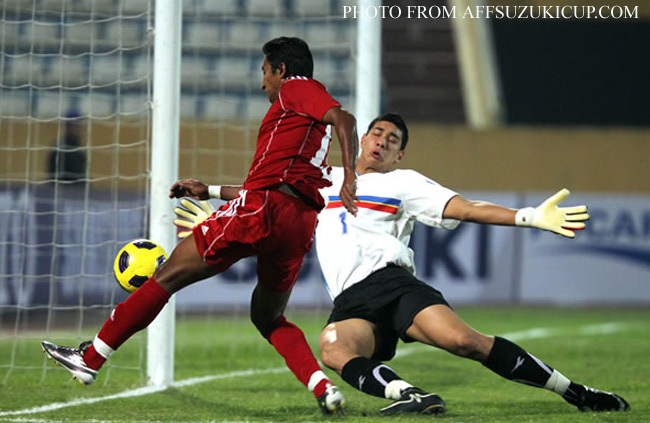 The Philippine national team has come along in leaps and bounds in less than two years. It is only appropriate that Etheridge grows as well career-wise. After all, he was right there even before this incredible joyride started.